Happy Father's Day! Yesterday my daughter Shelby graduated from high school at Innovation Academy Charter School, in Tyngsboro, MA. Congratulations, Shelby, and thanks to all the teachers and staff at IACS! This past year, through the IACS senior internship program (part of what puts the "innovation" into IACS), she spent Wednesday afternoons working with me at Dell/EqualLogic doing software testing, learning management of iSCSI Storage Area Networks and Python programming for our test tools. She'll continue to work there for the summer, then heads off to Hampshire College to study math. It was one of the greatest pleasures of my life to have her working with me. 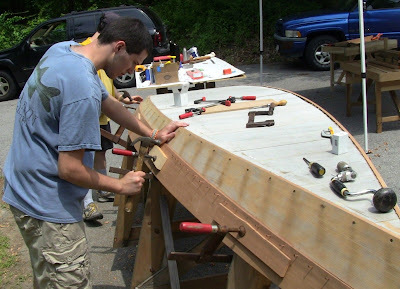 I helped out again for two days this week with the boatbuilding endersession project at the school. 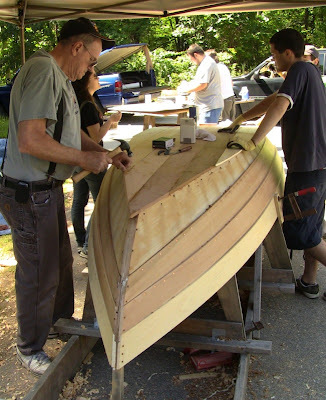 This was a continuation of the project started last June, building Harry Bryan's dory skiff "Daisy". 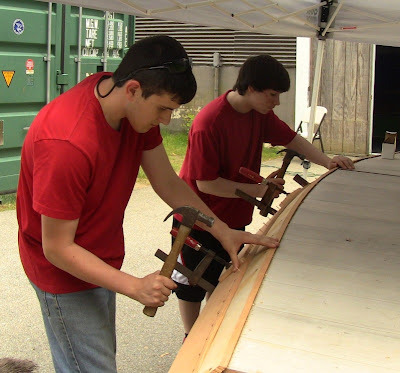 Several new students worked on it this year, along with several returning from last year. Shelby chose the art museum endersession, visiting a different museum each day of the week. 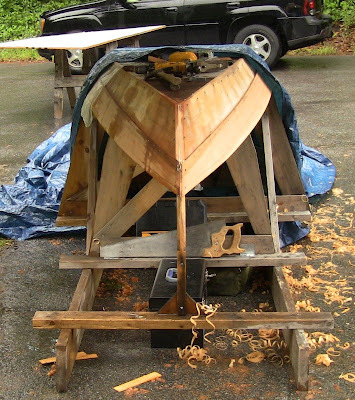 The partially completed boat had sat outside all year under a tarp, but other than some shrinkage in the bottom planks, it was fine. 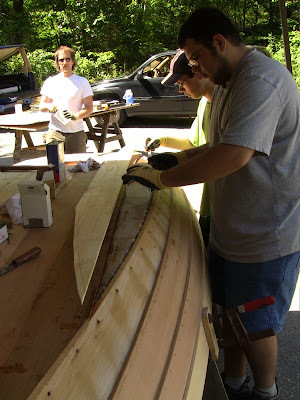 The group spent Monday setting back up and getting the second planks shaped. I came on Tuesday, as they were ready to form the gains in the plank ends. Fitting planks takes several people to hold them in place as they are clamped down and marked. 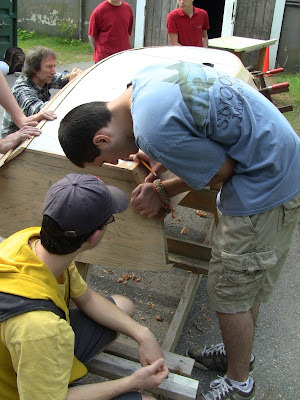 Mr. Smith, the group's teacher, setting the starboard #2 plank in place as Jared points out something on the bottom, and Rick and Chris hold the port #2 plank. 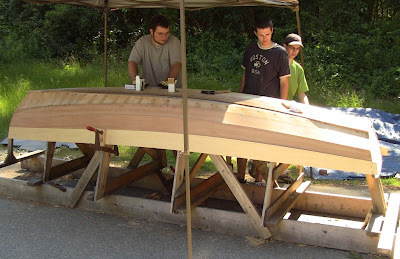 Nik (behind Mr. Smith) and Devin are standing in the background ready to hold the starboard plank. Chris marking the position of the gain. This is a short rabbet that starts as a half-lap at the end and tapers off to zero depth over a foot or so. The mating plank will have a matched gain. 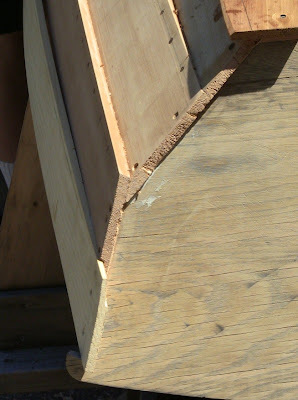 The shrinkage in the bottom planks. Mr. Smith said he would route the opening larger, then fit in a patch from the inside. This crossplanking will have longitudinal planks epoxied onto the outside. Rick forming the gain with a bullnose rabbet plane. Chris planing the plank down to the final line, lofted on with a batten after taking marks from the station frames. 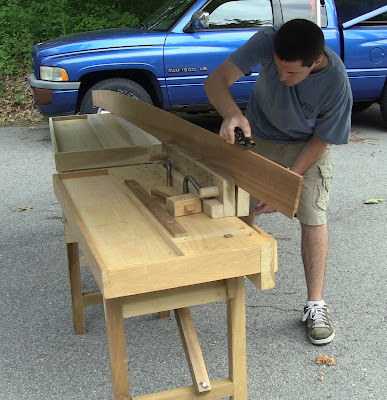 As you can see in the photo above, once again I find that my portable workbenches with Gramercy Tools holdfasts and Moxon vise make a versatile setup. 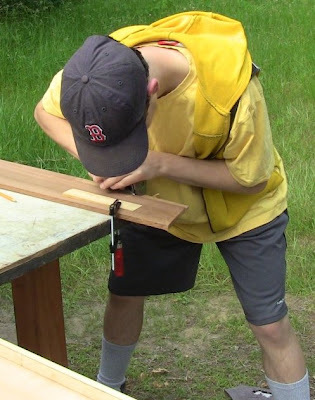 Once the final shaping and gains were done, as well as beveling the edge of the garboards, they clamped the planks in place, marked a line on each, and stepped off nail positions with a compass. They drilled pilot holes, then inserted copper cut nails. The nails are secured by clinching inside the boat against a bucking iron. Devin holds a piece of iron bar against a nail as a bucking iron while Nik hammers the head. This clinches the nail point over for a secure hold. Nik hammering while Devin holds the iron. 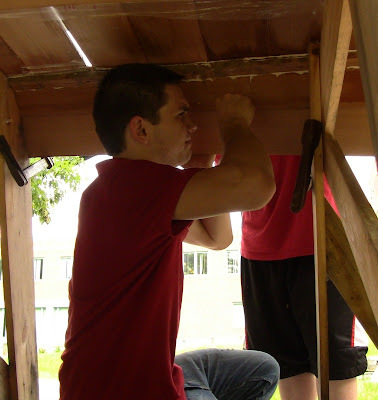 Jared and Mr. Smith clinching more nails. This is all pretty time-consuming, especially for people who haven't done it before. It was great to watch Rick and Chris working. Their experience handling the tools last year showed. They could simply be told what needed to be done, and they did it with no further guidance. When I got there Wednesday, Mr. Smith made the painful decision to cancel for the day due to rain. 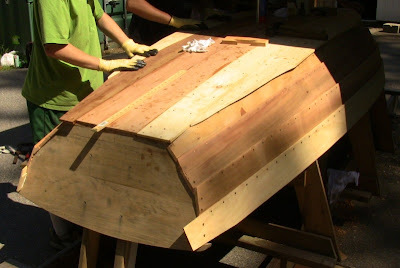 Even though we had portable canopies, he didn't want to attach side planks in the wet weather and risk having them shrink and split the way the bottom planks had. 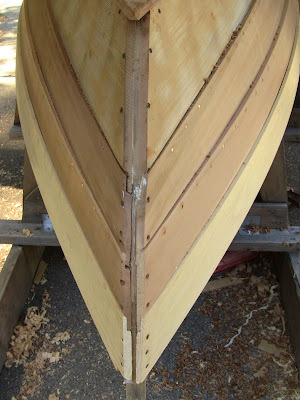 View of the stem with the #2 planks in place. I wasn't there Thursay or Friday, but I stopped by when I picked up Shelby at the end of the last day. They had made tremendous progress. 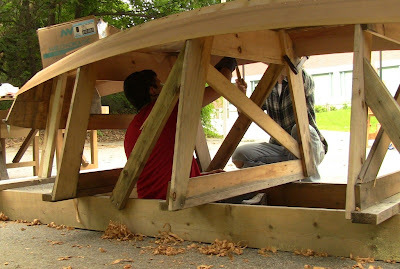 The remaining two planks were in place on each side, and all but the last longitudinal bottom plank had been laid. Gustav had joined them from last year, along with Chris' grandfather. Now that looks like a boat! Chris reads the warnings on the denatured alcohol as Gustav and Chris' grandfather look on. They used this to clean up uncured epoxy squeeze-out. 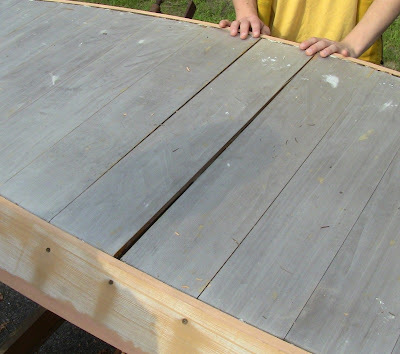 The outer bottom planks will be trimmed flush to the sides. The little nugget of knowledge I contributed was explaining what was meant by "denatured" alcohol, something I only learned recently. Denaturing is the process of adding poisonous additives to alcohol to render it unfit for human consumption. So DON'T DRINK IT! Ethanol, aka ethyl alcohol, has many uses as a solvent, but in its unadulterated form it is the alcohol in alcoholic drinks. In order to allow it to be sold cheaply for industrial use without coming in conflict with taxable beverage alcohol, the poisonous additives are put in to keep people from drinking it. Unfortunately, I think the message about what has been done to it has been lost over time. So DON'T DRINK IT! View of the stern quarter. Chris' grandfather finishes nailing a plank while Gustav and Mr. Smith mix the epoxy for the last plank in the background. Closeup of the stem joints. Note how the opposing gains form half-laps at the ends. Gustav pours epoxy for the last plank as Rick follows behind spreading it. As with any glue-up, epoxy time is a bit anxious, because everything has to smoothed into place before it sets up. Closeup of the stern starboard ends. These will be trimmed flush with the transom. Mr. Smith said he may do a little work on it over the summer, and may save the interior fitting out for a third endersession. There's still plenty of work to do once the boat is removed from the station molds, it just requires a slightly different set of building skills. Given the pace of work with novice hands, that and sealing and painting should fill a week. Maybe they'll be able to float it on the little pond behind the tent at next year's graduation! This is awesome! Any updates of finished product? No, I never did find out what happened after that. 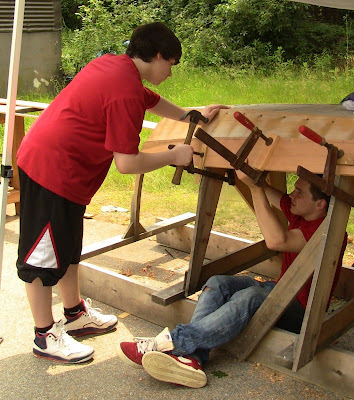 Hopefully the first years of the project were successful enough that people were encouraged to finish it off. They did have a real boat, all from their own hands!